Bri Ribaj: Lennon's New Biography: Thumbs Up! Lennon's New Biography: Thumbs Up! There is one major reason why Philip Norman’s new biography on the incomparable Beatle is a must-read: literary relevance. 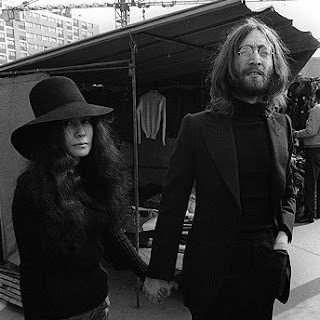 John Lennon: The Life exposes Lennon's humanity and idiosyncratic habits as an adolescent and mature man. And, most importantly, Sophocles' Jocasta & Oedipus goings-on just might make a wee bit of sense. As for Philip Norman, the established author has done it again. He shines as a narrator and the life details of his characters never seem tedious or labor-intensive to read. One more note, those of you interested in learning more about Lennon's creative process and music will not learn much about either thing from this book. But those of you who enjoy well contextualized biographies, will have a heck of a time with this text. In John Lennon: The Life, Norman focuses primarily on John, the human, not Lennon, the musical legend. I've been in the mood to read things Beatles lately so this'll do the trick. thx. why do you always review books that the library doesn't yet own?!? if i someday have a plethora of children, i think one might end up named lennon. i often wish he hadn't been killed when i was four.